"The goal is to keep faith with our veterans and keep our promises to them," Blumenthal told Greenwich Time during a wide-ranging interview on his transition from longtime state attorney general to senator. 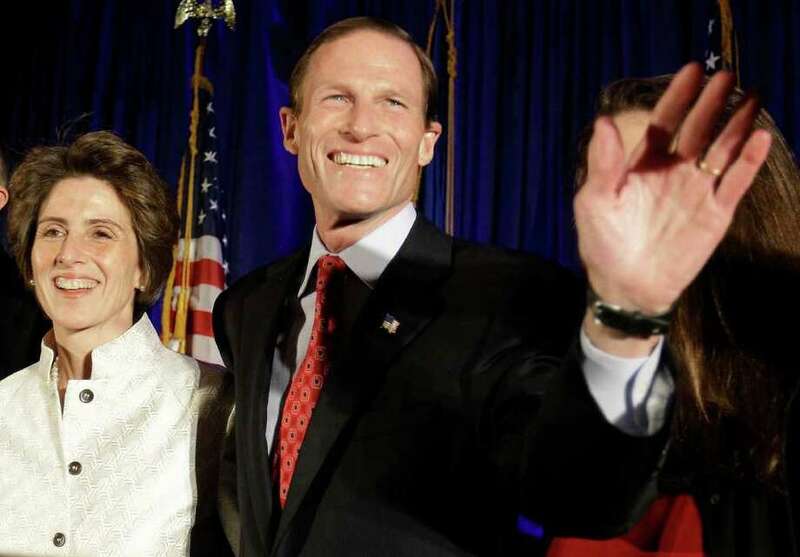 "Essentially, No Veteran Left Behind is a program that I've advanced, along with others, to improve job training, educational opportunities, employment openings and health care for veterans, including aid for homeless veterans," said Blumenthal, who served in the U.S. Marine Corps Reserve during the Vietnam War, but did not see combat. Forced to apologize for saying on multiple occasions that he went to Vietnam, Blumenthal survived the blunder and a $50 million spending spree by former World Wrestling Entertainment chief executive Linda McMahon in one of the marquee midterm races. In an adversarial role against Big Tobacco, polluters, Microsoft and scores of other defendants during his 20 years as attorney general, Blumenthal also requested a seat on the Senate Judiciary Committee. Assignments are determined by Senate Majority Leader Harry Reid, D-Nev.
Blumenthal is the most junior of the 53 members of the Democratic caucus, which he acknowledged could reduce his chances of getting the committee assignments he requested. "There's no bad committee, as far as I'm concerned," Blumenthal said. Less than three weeks from his swearing-in, Blumenthal said many of the details associated with the transition are in a state of flux. The budget for his office and number of staff are still being finalized. "On an annualized basis we would expect about $3 million, which includes all expenses, including staff," Blumenthal said. "It may be less given the fiscal issues that the federal government is facing." Blumenthal noted that both Dodd and Sen. Joe Lieberman, I-Conn., have more staff working for them because they are committee chairmen. Between retirements, incumbents who were ousted and more senior colleagues getting first crack at vacant offices, Blumenthal said he probably won't get a permanent office until March. "I have a temporary office on the ground floor of the Dirksen Building," Blumenthal said of the building located between Union Station and the Capitol. "Everyone is welcome to visit, by the way. It's kind of more like a closet than an office. It's big enough to do our work and welcome people when they visit." Blumenthal confirmed that campaign adviser Ty Matsdorf, the former mouthpiece for Sen. Max Baucus, D-Mont., will serve as his communications director. Matsdorf joins Beltway insider Laurie Rubiner, a Planned Parenthood executive and former legislative director for Hillary Rodham Clinton, on Blumenthal's staff. Rubiner, also a former legislative assistant to the late GOP Sen. John Chafee of Rhode Island, was hired as Blumenthal's chief of staff earlier this month. Blumenthal said he has also hired a deputy chief of staff, a constituent outreach/casework director and several other individuals who he would not identify because they are transitioning from their current jobs. "We're going to have absolutely a top-flight staff both in Connecticut and in Washington," Blumenthal said. Blumenthal pledged to keep up his role as a consumer advocate, citing his efforts as attorney general to get social networking websites such as Facebook, Myspace and Craigslist to amend their user policies. "All of these ideas of protecting privacy and security on the Internet will be very much a priority for me," Blumenthal said. Like fellow Democrat Jim Himes, who represents Fairfield County's Gold Coast and a sliver of New Haven County in the House, Blumenthal expressed his support for a White House compromise extending the George W. Bush-era tax cuts to all income brackets. "I'm disappointed in some of the provisions, but I would support it overall," Blumenthal said. "I want to see what the final version is. Assuming it has the payroll tax measures and cuts in Social Security taxes and continues unemployment compensation, as well as the middle class tax cuts, I believe the economy needs this kind of measure to help create more jobs." Blumenthal said he plans to keep his home in Greenwich and return to Connecticut probably three days every week. "I'll have basically a bedroom, a small apartment in Washington to hang my hat," Blumenthal said. "I don't want to be too comfortable." Roommates need not apply, however. Asked whether he would consider bunking with Democratic Sens. Charles Schumer of New York and Richard Durbin of Illinois, who have gained notoriety for sharing a row house in Washington, Blumenthal doused the prospect. "Cynthia vetoed that possibility," Blumenthal said of his wife.